A swashbuckling tale full of colour, adventure and romance – a good read! Publisher’s blurb: Lieutenant Peter Thorton of the 18th century British navy must struggle to come out gay while surviving storms at sea, ship-to-ship battles, duels, kidnapping, and more in his quest for true love and honor. The Sallee Rovers, Book One of The Pirates of the Narrow Seas Trilogy is an expertly crafted swashbuckler brimming with authentic detail and fully realized portraits of life at sea, written by a tall ship sailor and internationally acclaimed poet. (Note: The book if available in Kindle format). 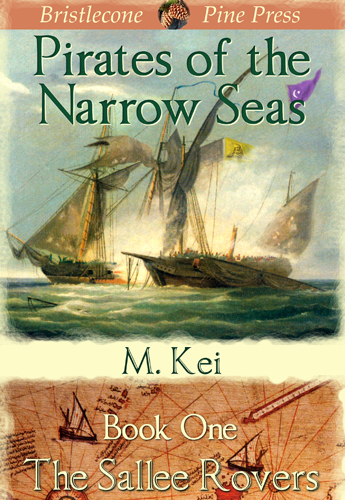 The Sallee Rovers by M. Kei [Bristlecone Pine Press, 2010] is the first of the Pirates of the Narrow Seas trilogy and, according to his bio, the author is not only an experienced sailor, but has also experienced many of the risks and challenges described in the story. He can therefore rightfully claim his status as an authority. Having said that, I must admit that I wouldn’t know the difference between a marlinspike and a hat pin. Nevertheless, when the discussion got tactical I had no difficulty following it, nor did I find that it burdened the story—that is, not at first. In this book we are introduced to Lieutenant Peter Thornton, a likeable sort but insecure in his role. This is partly due to being eclipsed by his best friend, Roger Perry (with whom he is secretly in love); being a partial orphan, and being new to his commission. As luck would have it—or perhaps not—he and Perry are both given assignments aboard HMS “Ajax.” The not-so-lucky part is the rather pompous and acerbic master—i.e. Captain Bishop. Moreover, matters are made worse for Thornton because Bishop takes an arbitrary disliking for him, such that he can do no right. The plot thickens when the Ajax comes upon a sinking Spanish galleon in distress, and Peter and a crew are sent aboard to free the enchained, galley slaves in order to give them a chance at survival. One of these is a commanding, Sallee Turk, who prior to his capture was a high-ranking captain of the Sallee Rovers (i.e. pirates). Somewhat true to his nature Bishop sets them adrift to save his own skin, and Peter and two other crew members are abandoned aboard the sinking galleon. Joining forces with the Sallee Turk, Captain Tangle, the galleon is saved and Peter becomes the right-hand confident of the swashbuckling Tangle. Thus begins a relationship that covers the gambit from admiration to frustration, and from conflict to romance. As mentioned previously, the first half of this story moves with the pace of a schooner under full sail, and adventure abounds on the ‘bounding mane.’ Peter is likeable, Perry is charming, Bishop is a pompous fool, Tangle is dashing in an ‘Errol Flynnish’ sort of way, and the supporting characters are all distinct and credible. The naval strategies and skirmishes with the Spanish off the coast of France are exciting and engaging such that you want stand up and cheer for the good guys. However, to me the pace seemed to slow in the second half when the story delved (perhaps a bit too much) into the belief’s and practices of the Islamic religion. Understandably, the author wanted to make a distinction between Islam and Christianity that Peter had to consider, and because it is all very interesting, but an overabundance of detail at the point where the reader is looking forward to a climax makes the story drag rather noticeably. Not seriously, but enough to detract. Having said that, this is a good solid read and I look forward to reading the others in the trilogy, Pirates of the Narrow Seas.